Test was carried out in Cerema labs at Clermont-Ferrend near Lyon, France. The new FIMA test procedures set a new standard for measuring sensor performance in typical demanding work machine conditions. 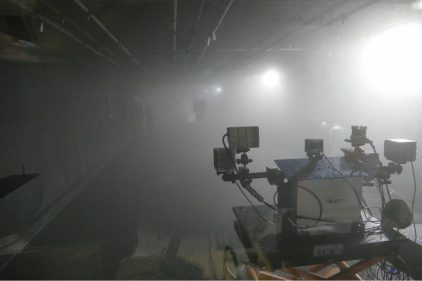 This fog test was done in seven visibility levels (10m, 15m, 20m, 25m, 30m, 40m and 50m) and with two droplet sizes. The task was to detect mannequins with normal clothing or dressed on worn safety vest. Other test objects were black/white plates 30cm x 30cm and 50cm x 50cm of sizes. The conditions in the fog chamber corresponded very well work during night. Do you want to co-author the FIMAblog? Now you have the chance to be featured in the FIMAblog. Head over to the post submission page and submit your article.